Back in Shiraz, when I was much younger, whenever we had a visitor who my mom wanted to impress, she would take over in the kitchen and make one of her mouth-watering and visually artistic dishes. 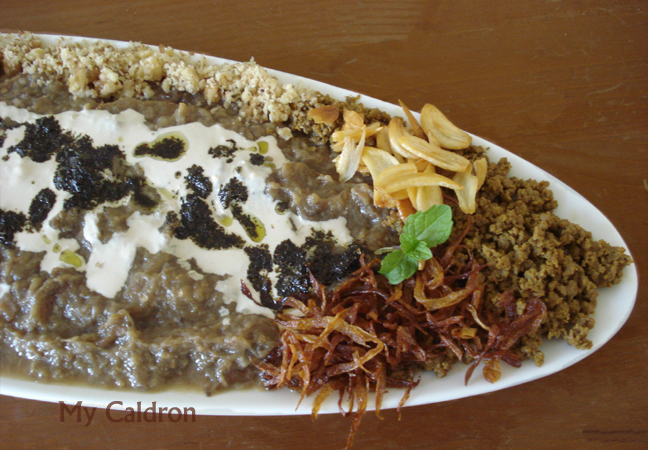 Kashk-bademjoon (made of eggplants and Iranian whey) with ground meat on the side was one of those memorable dishes. Remember Aash-e reshteh (“noodle-soup”)? Well, this dish shares some of major and unique ingredients with the aash, namely kashk, and fried mint, and crispy onion and garlic for garnish. If you don’t know what kashk is, please visit that post anyway to find out!